Missing the Sun? Here’s some Art! Now that Portland has entered the time of year when we rarely see the sun’s light or feel its warmth, I thought I’d bring to your attention the installation by Abigail McNamara at Duplex Gallery. Over the past few weeks she’s been installing her site-specific work directly onto the gallery walls, and her imitation gold leaf has the same sheen and malleability as the real deal. Gold has long been a sacred material. First recognized for how the metallic qualities resembled the sun, its symbolism expanded to include heavenly realms and divine figures, and its meanings continue to grow to fit contemporary life’s needs. A graduate of Lewis and Clark College, McNamara’s early work reflected her interest in natural processes. Nowadays she’s more likely to investigate the boundaries between natural and human patterns through maps of suburban sprawl, charts of population shifts, and the binary language of data. Her use of gold, as a natural material with deep cultural significance, is an appropriate medium to explore how nature mediates culture and vice versa. These themes of growth and decay combined with a meticulous craft techniques create the foundation for her time-based art. Her creative practice has moved into the realm of performance as she’s installed her work over the past month while the public has been able to stop by, watch, and ask questions. The time and resources for this ambitious, interdisciplinary project have been made possible thanks to a Career Opportunity Grant from the Oregon Arts Commission. A First Thursday reception, November 6 from 6-9pm, will mark the end of the artist’s creative process, and the start of when viewers can bask in in her completed work. Abigail McNamara will be on view at Duplex Gallery, at 219 NW Couch St, through November 21st. Roger Kukes, Land Labyrinth (Green), acrylic on paper. Augen – For dystopian landscapes full of ecological destruction, nuclear warfare, and the clash between native and colonial cultures, look no further than Theater of the Land. Roger Kukes will fill that quiet hole in your heart and make it swell with doubt as to whether civilization as we know it will survive the converging crises you’re mostly content to ignore day in and day out. I could make some comparison to the hellish landscapes of Hieronymus Bosch and the manifest destiny of 19th century American Landscape painting, but you don’t need art history to know we don’t live in an ideal world. Then again, maybe it’ll give you some hope to see your nightmare looking back at you. Katherine Mead, Kite Craft, mixed media collage. Gallery6pdx – For lighter but still stimulating looking, check out Field+Frame. Katherine Mead’s mixed-media collages use architecture motifs to frame landscapes in ways that play with perspective. Though less content driven, Mead’s compositions demonstrate the power of juxtaposition when handled by a mature artist. Corey Arnold, Fight or Flight, archival pigment print. Hartman – In coining utopia as “no-place”, Sir Thomas Moore located our “good-place” on the farthest fringes of civilization. 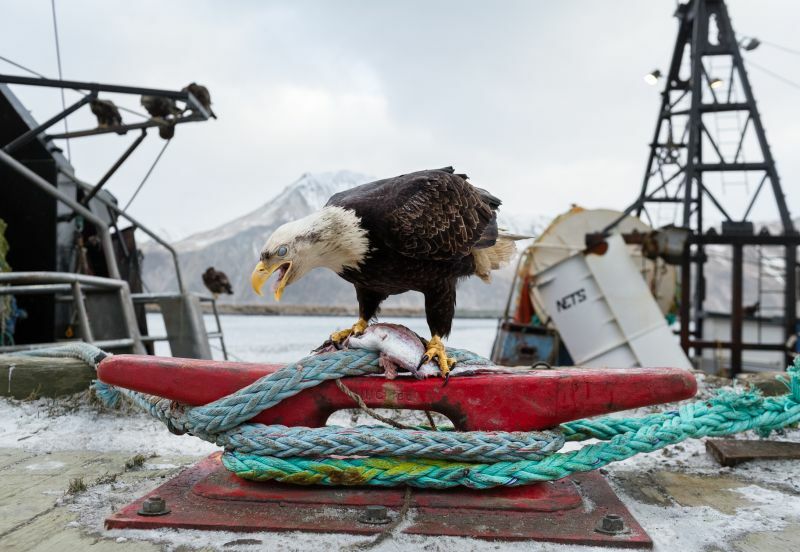 Corey Arnold’s newest body of work, Wildlife, is a series of compelling images of life on the edge of the Alaskan wilderness. Arnold has long been captivated and continues to be influenced by the natural world in his work as a fisherman and a photographer. APAK, Secret Sanctuary (detail), gouache on wood. Hellion – November is your last month to catch a show at Hellion before they take a two month hiatus from exhibiting. So hurry over to see In the Toy Box and Dreams within Dreams before the month is out. Remember the awkwardness of middle school? Well Ikumi Nakada does and creates soft, illustrative style images of boys and girls on the onset of puberty. These works will help sooth your shameful memories of that time. 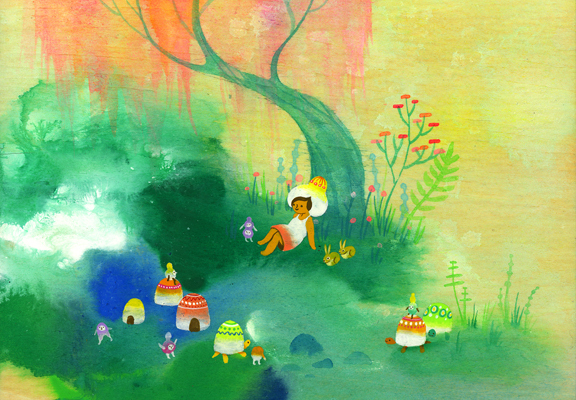 For lush, imaginative paintings of a magical far-off word, husband-wife team APAK has you covered. Image not available for Terry Atkinson, Greaser, mixed media and oil. YU – Terry Atkinson is an exceptionally influential British conceptual artist who founded the artists group Art and Language. Without a doubt you’ve seen derivative works by PNCA grads for years. After enduring all that you might as well go see the internationally famous version at Yale Union this month so you can say you did. On display are early works fabricated for the first time on site. Atkinson calls them Greasers, but most people understand them as paintings. Be sure to bring a rigorous class analysis of the art world with you for their opening reception on Saturday, November 8th from 3-5pm.